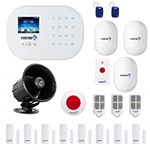 Fully programmable, the S6 Titan 3G/4G WiFi system will automatically notify you via WiFi, via SIM card, or by landline in case the security system is breached. This is the S6 Titan 3G/4G WiFi main panel only (with power adapter included). 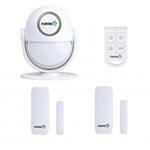 You can add one or more accessories to your shopping cart to create a system that fits your needs. 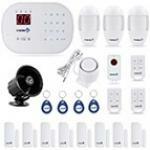 Any accessories purchased at the same time as the panel will be pre-programmed by our technicians before we ship it to you. 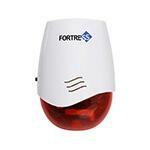 The Fortress Total Security Motion Detector uses Passive Infrared technology to detect motion. 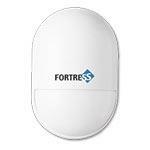 These sensors can pickup motion up to 25 feet from the device. With a viewing angle of 110 degrees horizontally and 90 degrees vertically you can be assured that these sensors will detect any intruders. Communication back to the main panel can be from up to 150 feet away depending on obstructions. With built in switches to control time between triggering events, and the LED that flashes to indicate detection of motion, conserving battery power has never been easier. 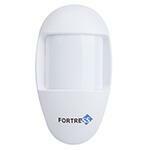 Fortress Total Security Motion Detectors use 2 AA batteries. 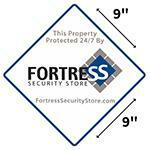 Deter intruders with the Fortress Yard Sign! 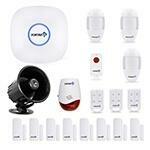 Show them that your home is protected by a complete security alarm system. The sign measures 9 by 9 inches and is made out of weather resistant polyethylene plastic that will never fade. Holes in the top and bottom enable pole mounting. RFID Keypad required (except for S6 and S03 systems). 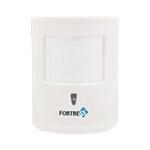 Extra RFID keytags for Fortress systems and the Fortress Secondary RFID Keypad.